Pinochle is a card game similar to Euchre or Hearts since the object is to accumulate “tricks” to record points. Pinochle is played with 48 cards: two Aces, Kings, Queens, Jacks, 10s and Nines from each suit. Ideally, Pinochle should be played with four players forming two partnerships. The partners sit across from each other during a game. Select a card from the deck. Pass the deck the next player, who selects a card. Continue until each player has taken a card; the player with the highest card deals first. Deal each player 12 cards. 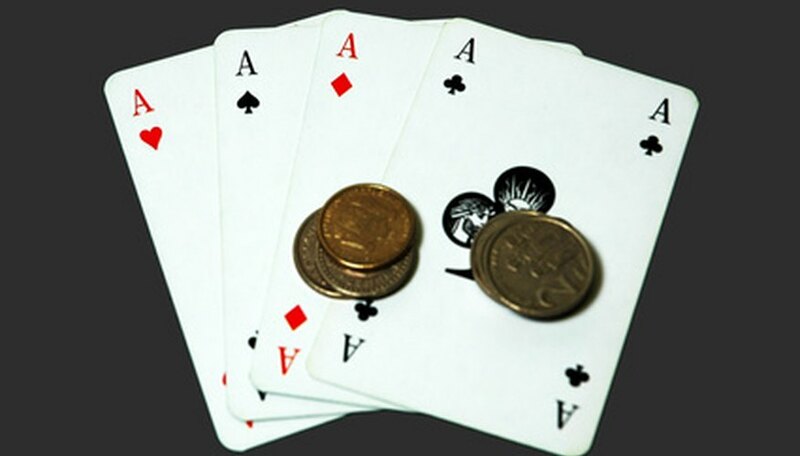 The dealer can give each player one to three cards at a time as he goes around the table. Organize the cards in your hand by suit and rank to easily identify potential points in your hand. Start the bidding with the player directly to the left of the dealer. Bidding begins at 10. Raise or pass on your turn. If you raise, you can only raise the bid by one. Each player has a chance to either pass or bid. Bidding ends once every player except one has passed. Prepare the cards you want to "pass" to your partner. Select four cards from your hand (if you are the bid winner) and pass them face down to your partner. Organize your newly acquired cards (if you are the bid winner's partner). The pass usually contains either a Trump card if available or an Ace. Select four cards from your hand and pass them face down to your partner. Passing is only done by the bid winning team and not the opponents. Place your cards face up on the table. All players must do this. Count your melds, starting with the bid winner and moving clockwise around the table. Tally your points. A run of Ace through Jack of the Trump suit is worth 15 points. A double run, two of each of the Run cards, is worth 150. If a player has the Jack of Diamonds and the Queen of Spades, he gets 30 points for having a Pinochle. Aces Around (four aces in a hand), King Around (four Kings), Queen Around and Jack Around are awarded 10, eight, six and four points respectively. A marriage, one King and one Queen, is two points. Lead with a card from your hand (if you are the bid winner). The player to the left follows. Place a higher card on top of the previous player, if you can. To win the trick a player must place a higher card from the same suit. Play a Trump card if you cannot follow suit. The player with the highest card wins the trick. Count any counters (the Ace, Ten or King). Counters can be worth as much as 24 points and the team that took the last trick can get one extra point. Score points for the bid winner's team. If the number of counters is equal to or greater than their original bid, the score is added without punishment. If it less subtract that score from the total. Tally the counters of the opposing team. Play until one team has 250 points. Based in Grumo Appula in southern Italy, Riccardo Giovanniello has been writing news and restaurant reviews since 2008. His articles have appeared in “Daegu Pockets” and "All About Golf Resorts" magazines. Giovanniello holds a Bachelor of Arts in film theory and English literature from the University of Western Ontario.